When the Guardian surveyed Pinellas County government agencies, all 12 agencies incorrectly claimed that an Emergency Access Permit (EAP) is required for reentry after a hurricane. The EAP program has been in place for 15 months, yet the dozen agencies who issue the permits still give citizens incorrect information. The Pinellas County Sheriff’s Office (PCSO) incorrectly says on its own website that an EAP is required for reentry, which may be one reason why incorrect information is being propagated to citizens through other local government agencies. The EAP program is PCSO’s program for post-hurricane reentry on to the barrier islands of Pinellas County after he has declared the area “safe and secure for entry and reentry” (as allowed by section 34-29 of the Pinellas County Code). However, the EAP program itself is not codified in any state or local law. This is the 2nd article in a 3-part series on PCSO’s EAP program. In our first article, Gualtieri said that a permit is “NOT required”, thereby refuting his own agency’s published information. Gualtieri also dismissed concerns about the legality of the program. According to WFLA News Channel 8, Gualtieri (pictured right) came up with the idea of the hangtag EAP program. However, only 20% of those who qualify have signed up for an EAP. Already when the EAP program was unveiled, barrier island residents like Melissa Dotson of Indian Rocks Beach raised multiple concerns about it. The Guardian started asking PCSO questions about the program in March of 2015, but received no answers to our questions until months later. Pinellas County – falsely claims that “once a mandatory evacuation order has been lifted, Emergency Access Permits will be required to re-enter an evacuated area.” We will refer to this as “the false standard claim” throughout this article. PCSO – given that EAP is a PCSO program, the false standard claim most likely originated from PCSO’s own page on the EAP program. City of Clearwater – their information links to a April 2015 PCSO news release, which uses the false standard claim. City of Belleair Beach – displays information provided to them by PCSO, which in turn uses the false standard claim. City of Indian Rocks Beach – nothing is posted on their website, so we called the city. A person employed by the city for 18 years (name withheld) said he could answer questions about the EAP’s. This person then incorrectly asserted that an EAP is “required” for reentry, and that only “owners” can get them. Town of Indian Shores – “you can’t come across unless you have a pass”, police dispatch incorrectly told us in this phone call. More on Indian Shores later in this article. 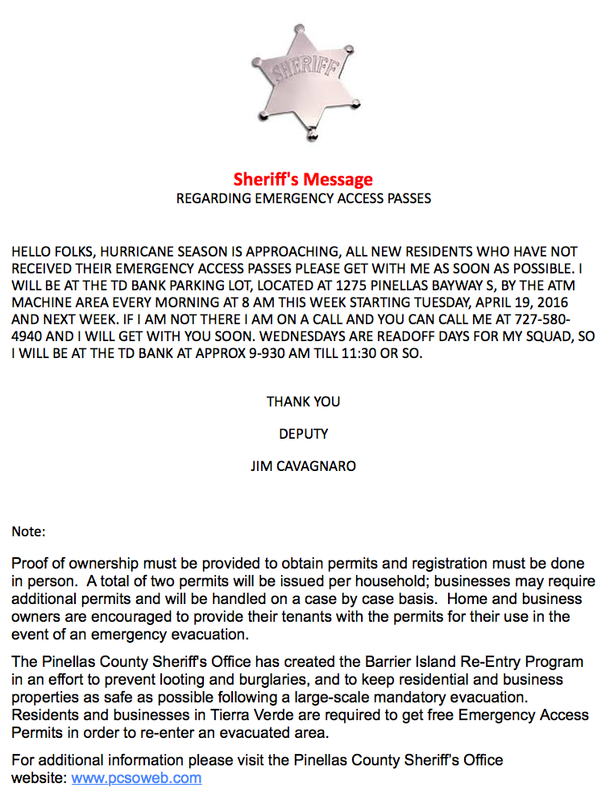 Town of Redington Shores – in March of 2015, Redington Shores Mayor Bert Adams falsely claimed in this newsletter that “the passes will be required to come back into Town after an evacuation.” In February of 2016, Adams declared (see immediately above) that renters must have permission from the property owner to return after a hurricane. This raises the question: don’t renters also have a right to return and to protect their personal property? Town of North Redington Beach – falsely claims that both an EAP permit and a photo ID are required for residents to reenter. Town of Redington Beach – uses the false standard claim here. In a phone call on 6/1/2016, a town employee incorrectly stated that an EAP is “required for reentry”. City of Madeira Beach – uses false standard claim here, and puts the second half of it in bold red red letters (see above). City of Treasure Island – uses the false standard claim here. City of St. Pete Beach – uses the false standard claim here. Government agencies from north to south, both large and small, unquestioningly repeated PCSO’s false assertion that an EAP permit is “required” in order to reenter. Then there’s Tierra Verde, which is not a city. The PCSO deputy assigned to Tierra Verde also made the false standard claim (here). In addition, the deputy said landlords should “provide their tenants” with permits, implying that renters cannot get permits themselves. The PCSO deputy’s message appears on various Tierra Verde Facebook pages. Pinellas County government funds PCSO, yet they also simply parroted the baseless claim of a “requirement” without asking whether such a “requirement” was legal. In the case of county government, the false standard claim appears in multiple places, including the last two pages of the county’s “emergency re-entry plan“, which covers the EAP program. The county commissioners apparently also never bothered to ask why access to the barrier islands should be restricted and enjoy special protection in a way that applies to no other part of the county. In a testy e-mail to the Guardian on May 26th, Gualtieri said “I will say it one more time……the permit is NOT required. You don’t seem to be understanding that the permit is not required.” Time will tell if the sheriff use the same tone in straightening out the dozen government agencies who incorrectly administer his EAP program. The recording of entry and exit raises additional constitutional questions, and also public records issues as residents may object to their entry and re-entry times and locations being a public record. PCSO’s press spokesperson Spencer Gross did not answer our questions or provide or comments for this article, even after we pointed out that PCSO is still propagating false information on its website, in press releases and elsewhere. Hughes’ opponent in the county commission race, Janet Long, did not respond to a written request for comment. 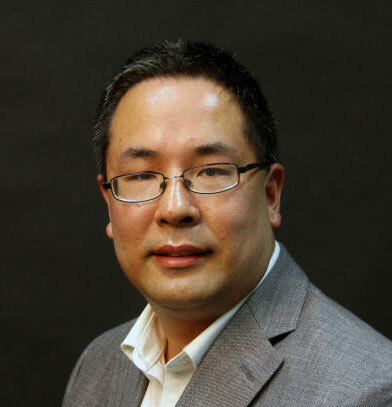 The Guardian also reached out to County Commission chairman Charlie Justice and his opponent this fall, Mike Mikurak, but neither responded to our repeated questions and requests for comments. The issue of EAP’s is topical because Florida is one of many states that could be impacted by the Atlantic Hurricane Season. The season begins June 1st, with the probability of hurricanes sharply peaking in August and September, before the season ends on November 30. The Guardian will continue reporting on EAP’s because under the Florida Constitution, all political power is “inherent in the people”. Government “agencies” are so named because they act as agents for the people, and are not authorized to use tax dollars to lie to the people they represent. Does the old principle “ignorance of the law is no excuse” also apply to government agencies who are ignorant of public safety programs they administer? As always, the Guardian reports and the readers decide. 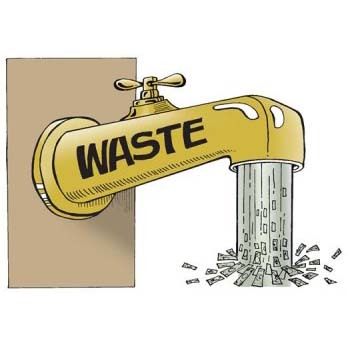 For more thought-provoking cartoons from the same artist, please click on the cartoon.